Happy Friday! Here's my #galaxy nails for #nailartfeb. This is totally cheating, because it's not "real" galaxy nails, I just don't really love that design, so I stick to "galaxy in a bottle". 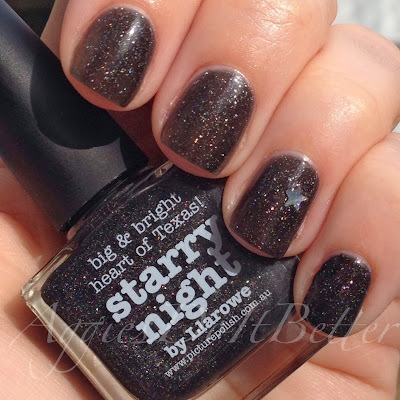 This is Picture Polish Starry Night. LOVE! I thought since I had it out I'd do a quick comparison with Zoya Storm. On my first 2 fingers on the left is 3 coats of PP, on my middle and pinky is 2 coats of Zoya Storm. Yep Zoya is sooooo much more opaque! surprising!